Given the slow worldwide economic recovery, it’s an appropriate time to review our core tactics. Many of us are finding our clients and prospects are risk averse. Here are some effective strategies you can proactively use to increase your sales, no matter what the economic climate brings. You might be asking “Who will buy from me now?” when so much seems to be at risk. Focus on the positive: It’s very easy to be overwhelmed with negative messages, and bad news always gets more interest than good news. To be successful, however, your attitude is essential. Tune out all the information that isn’t helpful to you right now. Turn off the 24-hour news cycle and the minute-by-minute updates from your smartphone. There is always a lot going on in the market that’s outside your control, so instead focus on what you can control. We are not suggesting that we put on rose-colored glasses. Rather, we should simply find opportunity and positive news wherever we can. Maintaining that positive attitude will help you defend yourself against constant bad news. Focus on empathy: The best salespeople in any industry are the ones who know how to solve their customer’s problems. In uncertain times, people become much more risk-averse, sticking with what they know to be secure and stable. If you’re a problem expert, your job will be to get in tune with your client’s fear of uncertainty. Their fears may manifest in multiple ways, including taking a longer time to make decisions and involving more people to make them. Empathize by offering customers increased understanding and flexibility, and they’ll recognize the security you offer. Focus on real value: Prospects and customers need to understand the real value you offer. When they are uncertain, they spend more time making the decision to buy, and they are concerned about real monetary gains from their investment. Focus on the real value you are providing to them. Are you positioned to save them money or grow revenue? Focus on preparation: Sales executives are most successful when they’re purposeful, customer-focused, and ready to execute. Spend more time understanding your clients, their industries and markets, and building creative solutions with them. In the end, you’ll spend less time fixing problems in the sales cycle that arise. a. Should I buy this? b. Can I buy this? c. Is it worth it? 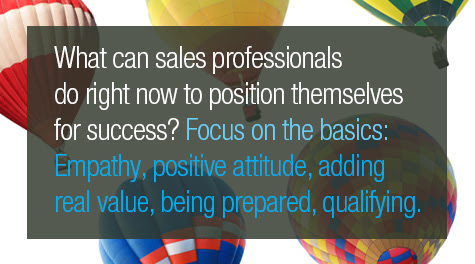 Knowing your prospects’ answers to these questions is essential before you begin investing time and resources in a sales cycle. If your prospect is not qualified, let that one and find someone who is. Remember, your competitors have the same difficulties that you do. Stay calm, stay focused, and look for their vulnerabilities in the marketplace. You should be playing both defence and offense with your current customers to defend your position. By staying focused on the customer, you won’t be outsold, and you can win the customer’s business and loyalty. In the course of my career, I can’t remember how many times I have heard some version of this phrase from entrepreneurs. In fact, there is a thriving industry that has grown to service exactly this need: door openers that use their connections to get warm introductions to companies for a retainer and a commission. Even with that, why is it that most startups fail for lack of sales? Is it because the introductions weren’t warm enough? the entrepreneurs weren’t competent enough? the product wasn’t good enough? or something else? In this series of blog posts I will explore some of the reasons behind this and what can be done to mitigate the risk of failure. In my view, the failing is in the mindset which leads to a flawed approach. Having a repeatable, scalable sales and go-to-market strategy is not akin to flinging stuff on a wall and seeing what sticks. You need a plan. You also need to be nimble and reduce your burn rate. Most of all you need commitment from the executive team. The good news is that there are people that have thought through this. In fact, it would do entrepreneurs a lot of good to learn more about Steve Blank and Eric Ries. Steve Blank (steveblank.com) has written extensively on developing a customer before you even go ahead and develop a product. There is a lot of truth to that but it may not always be easy to do. Not to worry. In case of companies that already have an offering but are looking to penetrate new markets or grow in existing ones, it will do them a world of good to understand the needs of potential customers before doing much else. There may be an unmet need that they can exploit. There may be channels that can be used, partners that can be leveraged. The point is that, if you elicit potential customer feedback, you will likely spend less time and money and have a greater chance of success, than if you were to enter the market and tried your “luck”. Eric Ries (http://www.startuplessonslearned.com/) has taken the philosophy behind the “Lean Manufacturing” techniques developed at Toyota Corporation and applied them to startups. The key philosophy is to have multiple, quick, low-cost trials of the product with real customers to figure out what customers really value and throw out what they don’t. The idea being that you don’t end up spending millions of dollars and many months in developing something that the customers don’t care much about. There is a lot to learned from these gentlemen. There is a lot also to be learned from one’s own experience and other helpful individuals’. So, dear entrepreneur, slow down a bit, assimilate information, think, and then act. It will do you a lot of good. Above all, know that entering new markets or developing new customers is hard work that requires time, thought and resources. It is not just a matter of opening doors. If anybody tells you otherwise, then I have a bridge to sell you.